For those who follow my blog, you will know that ever since I started using Korean skincare products, my face has improved a lot. In fact, I went for months without one pimple (even when it was that time of the month)! So when I bought the History of Whoo Secret Court Cream samples, which is for troubled skin, I actually wondered when I would ever find a need to use it. Well, karma is a b!tch and this exam season has been particularly brutal. Ever since February, I've been having 2-3 pimples on the right side of my face that will just NEVER go away. They're not big ones, 2-3mm in diameter, but they never ripened and even after two MONTHS did not go away. I even tried antibiotic gel! In addition, products that are in my usual morning routine like Missha Super Aqua Cell Renew Snail Cream and night routine like Missha Super Aqua Cell Renew Snail Sleeping Mask, suddenly seemed to make my face react. I read from Hope in a Blog that these two products were best used together as the Secret Court Cream was very thick and rich, more like a balm. So I mixed them together and it became more like a sticky gel. As you can probably imagine, it's hard to use something sticky as a day cream, so I used 1/3 the amount that I use at night for the morning application, and found that worked in taking away the stickiness. I had more product samples than shown in the picture (I forgot to take a pic until I was almost done..oops). Each sample lasts around 3 days. I used it for 4 weeks in April but didn't have time to blog about it until now. Below are before and after pictures of both sides of my face. One side of my face had the never disappearing pimples and the other side of my face had the weird bumps that looked like my face had an allergic reaction. This is the side of my face with the pimples. I know the lighting is totally different but I tried and tried and still couldn't get the lighting to be the same so I gave up. But I thought any picture is better than no picture. The picture on the left was my face literally for three months. The pimples would never go away. If they did, it took a month and was replaced by another new, just as slowly growing one. 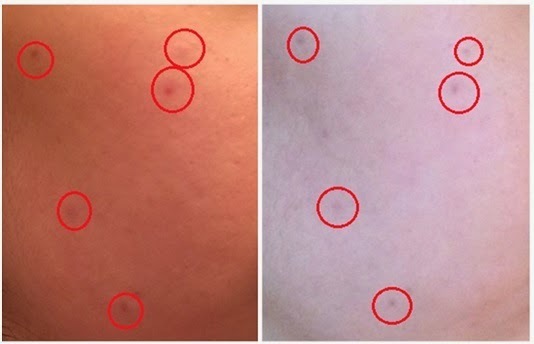 In the picture on the right, you can see in my red circles that the pimples have gotten flatter and have finally scarred (despite the difference in lighting, you can see that the pimple are less apparent and blend into my skin better). I want to mention that this 'After' picture was just taken today. Since using the Bichup Ja Saeng Essence and Secret Court Cream for around 4 weeks in April, my pimples have not come back, so these products actually have lasting effects on the skin. This side of my face didn't have pimples, but it had lots of little bumps that look like they were going to blossom into pimples any time. 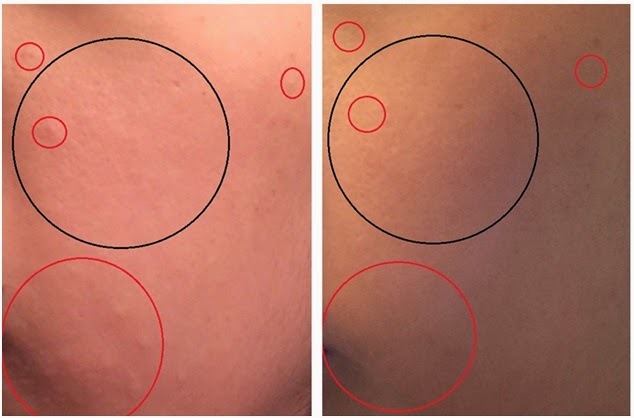 As you can see, all the little bumps in the red circles are gone. Also, if you look at the black circle, you can see that my face is a lot smoother and calmer. This 'After' picture was taken at 2 weeks, so I agree with the Bichup Ja Saeng Essence's claim that you get better skin complexion in 2 weeks time. These products really do what they claim on acne! They took away those pimples that my previous Korean skincare products could not do. I'm not too sure about the anti-wrinkle and elasticity improvements, but I believe this product's main target is for troubled skin. Unfortunately, these two products don't whiten your skin. I definitely need that for my unhealthy looking skin tone, so I won't be replacing my morning and night routine with these two products. They also don't take away scars, but I think they have a product from the same line called History of Whoo Repair Cream that is for scarring. Acne-wise, these two products really were a life saver! If this ever happens again, I know what to buy. Yes it is! And I hope my reviews will be useful to you in your research for better skin :) Best of luck! may I know your detailed. skin routine? I dont know which products I can use along with jasaeng, like, which cleanser? do all cleanseer can do? can I use doctor's product? bc, I just think our daily skin routine do have effects with the result, right?